Slowly but surely historical information is being published online for all to access and the so called 'invisible web' of non-digital information shrinks each day. Over the next 2 years the Dead Sea Scrolls are being carefully photographed and will then be shared online. The 2000 year old Dead Sea Scrolls were discovered in a cave in 1940, however every time the Dead Sea Scrolls are exposed to light, humidity or heat they deteriorate. The entire collection was photographed in infra-red in the 1950's and these photographs will also be scanned in for future internet viewing - useful as they show elements of the Dead Sea Scrolls that have since been lost. The sensitivity of the Dead Sea Scrolls means that access has been severely restricted. Showcasing them online will bring them to a global audience and according to the New York Times the digital photography process being used is "revealing previously illegible sections and letters of the scrolls, discoveries that could have significant scholarly impact." At the same time George Orwell has started posthumously blogging at http://orwelldiaries.wordpress.com. The first George Orwell post was created on August 9, exactly 70 years after George Orwell wrote it. The George Orwell diaries include his thoughts on fascism, communism and the press as well as details of his travels to Morocco and the time he spent fighting in the Spanish Civil War. The George Orwell diaries cover a 4 year period between 1938 and 1942 and the aim is to publish an entry each day for the next 4 years. Writing up George Orwell's diary as a blog is an interesting way of bringing it to life, particularly with the large number of comments that are being left for each post as readers offer thoughts back to George Orwell or try to start discussion with others around Orwell's themes. Robert McCrum in the Observer argues that in many ways Orwell would have been pleased by the democratisation of publishing through the internet, though anxious about blogosphere payment models! 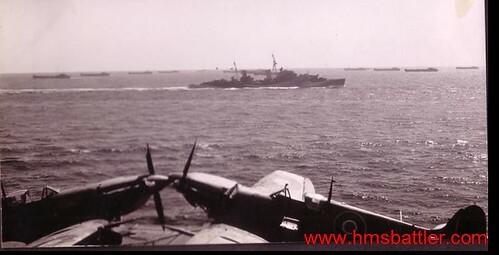 I have also started retrospective blogging, writing up my late grandfather's wartime HMS Battler Diary Of Flight Operations at www.hmsbattler.com. Furthermore I inherited his wartime photograph collection and have posted nearly 300 scanned Second World War photographs to Flickr at http://www.flickr.com/photos/hmsbattler. I wasn't expecting people with surviving relatives from HMS Battler to contact me through the site though. I have received various messages and some people have also sent additional content for me to include / share. Most recently some of the photos I have posted were included in Britain At War magazine after the editor found them on Flickr and emailed me to ask for permission to include them in an article. I'm really pleased that 60 year old material that I have posted is being well received and I have enjoyed hearing additional stories! Previously I have written about the invisible web. I wrote about the BBC Memoryshare project and the idea that whilst Google may now index a trillion pages, the invisible web of historic documents and peoples memories is infinitely larger. Wikipedia may have a huge volume of entries and Google may be scanning in the world's libraries but I think the real joy of the internet is its ability to preserve and distribute personal memories and information too. As time goes on, more and more people are sharing historical information online and the methods of doing so are becoming more creative - I wonder if we will ever get to the point where all human knowledge is available on the internet? ..........and if someone can tell me how to hack the Blogger template to allow posts to be dated pre-1970 it would make things even easier! An emerging standard, ISEN, might take a huge chunk out the invisible web once implemented fully. Let me know if you have any questions if you'd like to blog on the subject.